A new law this summer, “Unlocking Consumer Choice and Wireless Competition Act,” makes it easier for consumers to change their cell phone service. We are retired and want to receive the most value for our money that we have earned and now spend. Earlier this summer, we declared our independence from pay TV, bought an indoor antenna, cancelled cable TV, and are now enjoying saving $900/year. We recently re-evaluated our mobile phone service and found that we can get more value for less money! 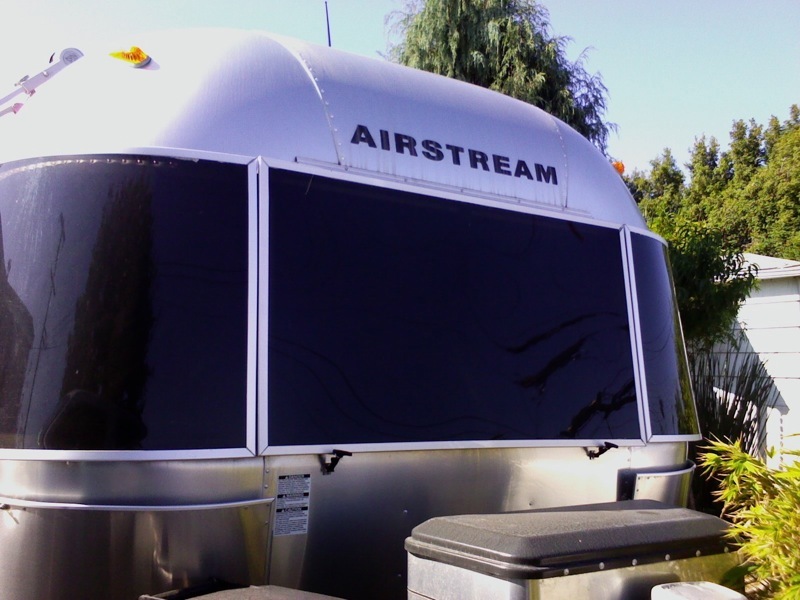 Our mobiling needs began when we began Airstreaming with our new Safari in 2007. We bought our first mobile phone primarily for safety and emergency concerns while traveling away from home (we have an AT&T landline). We chose Verizon because of reports of good wireless coverage and bought a basic flip phone for $99.99 and have stayed within our allowable 450 minutes/month, resulting in a monthly service bill of $43.69. Actually, we rarely use more than 200 minutes/month, so while reviewing our current service, usage, and costs, we looked at Verizon Nationwide 65 Plus Plans, such as the single line, 200 anytime minutes for $29.99/month, with an overage charge of $0.45/minute. 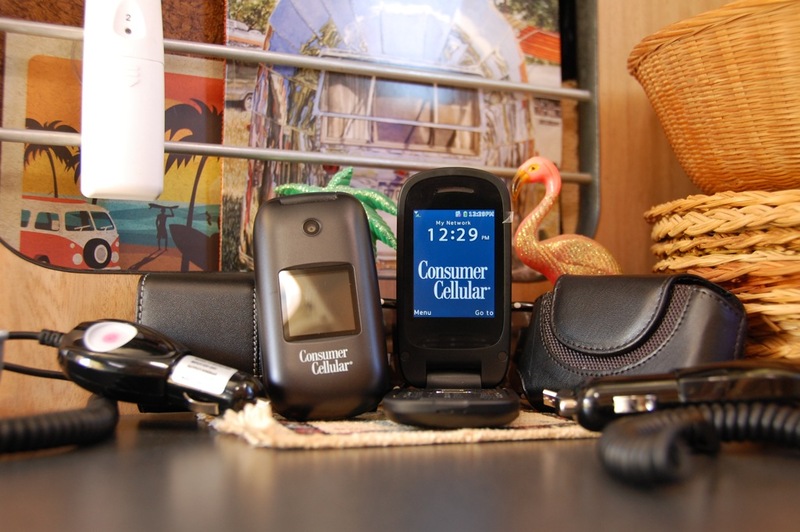 I then reviewed the Consumer Reports January 2014 issue on choosing the best phones and plans, and I was surprised to learn that Consumer Cellular* was the leader in their satisfaction survey, with top scores for value, data, and support. According to Wikipedia, in 2014, “Consumer Cellular received the highest overall satisfaction rating in the mobile carrier category of PC Magazine’s 27th annual Readers’ Choice Awards survey…” I liked reading and hearing that Consumer Cellular has inexpensive plans that require no contract and can be changed anytime without a service fee, operates from the AT&T network, and is the exclusive wireless provider for AARP members (and gives AARP members discounts). Consumer Cellular* has a low-cost family plan that lets family members share minutes, and calls between phones on the same account are free (otherwise, there are no free mobile-mobile or free night and weekend minutes… See Consumer Cellular’s FAQ webpage). We are AARP members and make few calls and don’t text or surf the internet with a phone, so a Consumer Cellular Family Plan through AARP made sense to us (text and data plans are optional). We chose the Anywhere/Anytime 200 minutes Voice Plan, $15/month ($14.25 for AARP members). 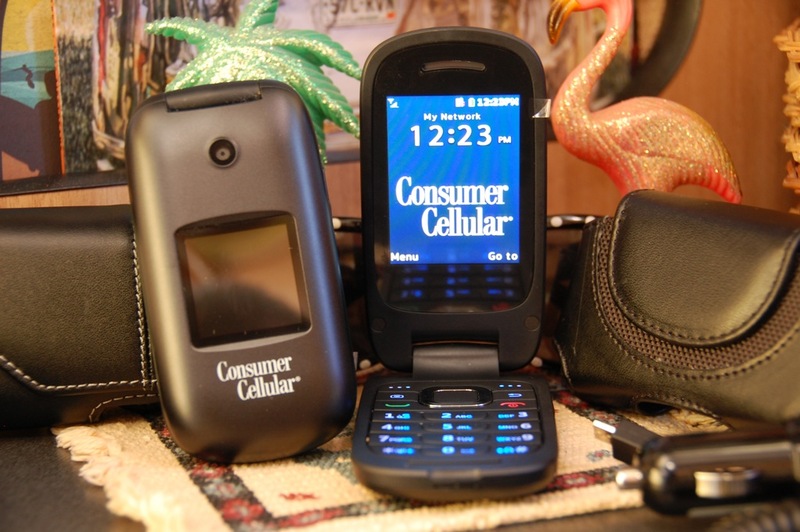 Since this is so inexpensive, we purchased two new flip phones, Consumer Cellular Envoy,* for $35/each. The additional line will cost $9.50/month, so our expected monthly service charge, including surcharges, fees and taxes is expected to be about $26/month, saving us of over $200/year! We chose both the black and red Envoy phones and had our previous mobile phone number ported to the black phone. Each mobile phone comes with its own wall outlet charger. We also got two Premium Combo Packs that include a car charger adapter and leather case. The Envoy phone can provide text messaging and 3G networking, should we want these options in the future. Now we each have a mobile phone that we can personalize with photos, contacts, and MP3 music (the phone is also a MP3 music player and I can add an optional microSD card, up to 32GB). We can now contact each other whenever we want and can find each other when out shopping, camping, and hiking (in most campgrounds that we visit). Envoy’s two megapixel camera* is adequate for our purposes and will be helpful if an accident occurs while traveling. I was pleased that the phone has Bluetooth and I learned how to transfer files using Bluetooth,* once the phone and MacBook Pro were paired. Below is a photo taken with the Envoy phone, transferred to the MacBook Pro’s iPhoto library, and uploaded to this article.